House Mice vary in color from light to dark brown. Their bodies are covered in short fur, while their ears and tails can be almost naked. House Mice typically grow between 5 and 8 inches long and communicate with other mice using high-pitched squeaks. What does a House Mouse eat? A House Mouse will eat almost anything, although it prefers grains and vegetation. How can I tell if I have a House Mouse infestation? House Mice are nocturnal, so they are most commonly active after dark. You may hear scratching and squeaking during nighttime hours, sometimes coming from behind walls or ceilings. The most telling sign of a mouse infestation is the presence of droppings. You may also notice teeth marks where the House Mouse will chew and gnaw on objects, and areas where they nest may also be surrounded by debris and droppings. You may also notice a distinct urine smell around areas where the population has been concentrated or growing for a long period of time. How can I prevent a House Mouse infestation? A house Mouse can enter your home through extremely small spaces, so be sure to check thoroughly when attempting to seal holes around the home. Keep your home as free of crumbs as possible, and keep food off of counters and stored in airtight containers. Give us a call or shoot us an email and we will be happy to help you with your mouse control problem! 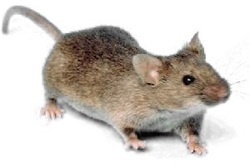 Click here to learn about the Deer Mouse!